What does it take to get a good job in today’s ever-evolving economy? Some people looking for that next position believe that networking is a key to success — whether through social connections or websites like LinkedIn. Others focus on crafting the personal brand they think will appeal to hiring managers. 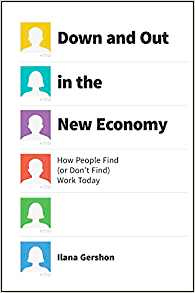 But a lot of those job seekers are way off the mark, says Illana Gershon, who has researched what works best and has reported the results in her book — Down and Out in the New Economy: How People Find and (or Don’t Find) Work Today. Gershon, an Indiana University professor of anthropology, discussed her findings on the Knowledge@Wharton Show, which airs on Sirius XM channel 111. She summed up the pervasive myths and out-of-date techniques, and offered advice for taking the pain out of the job-hunting process. Another mistake to avoid is not following up with an employer after your interview. To make sure you remain on the employer’s mind, send a follow-up e-mail of about three or four paragraphs that summarize your skills, reiterates your eagerness to be hired, and thanks the entire staff for their time. Although your professional history may be so amazing that you want to share every piece of it, it’s important that you avoid creating a resume that stretches out too long. By focusing on related positions and highlighting the top moments in your career, you can easily reduce your resume to two or three pages. As you can see, there are a lot of ways to make mistakes when conducting your job search. The good news is that mistakes are avoidable if you are aware of them and make a determined effort to sidestep them at all costs. What you suggest is a generic response that will be recognized as such. Also, this ‘reply’ does not necessarily reflect the interests of the employer who is always asking, ‘how does this benefit our company?’. Ignoring for the moment each person’s ‘reason for leaving’ is an individual response, I would suggest in the meantime that a candidate/applicant respond that the particular job/opportunity would be enabling that person to execute a particular skill set they have and at which they excel, being sure to include metrics/examples of how this has in the past shown up in the workplace. In this way, the employer is being promised that the applicant’s future job activities will directly benefit the hiring company. A less promising but perhaps acceptable reply, depending on circumstances, would be to suggest the opportunity/job will enable the applicant/candidate to learn/reinforce a strength they will be able to immediately put to use on the job. This would work if it is understood in advance the person coming into this job would be learning as they go, suggesting that something they already have in their kit bag would be empowered/enhanced by the job itself; that what they know already would be an enabler in taking on the new job (and presumably excelling at it). Again, in this case, the company would have a reasonable expectation of benefiting from the candidate’s/applicant’s learning curve and gives the interviewer reason to recommend that person be hired.